Discount UK, the Poundworld-owned variety store retailer, is to open the doors of its new Newcastle store at 10am on Friday (4 November). 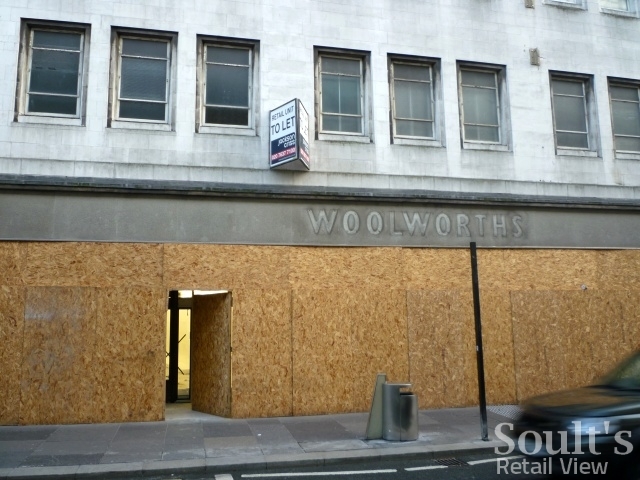 As I reported a month ago, contractors on site first revealed that the Clayton Street premises had been taken over by Poundworld, nearly three years after the long-established Woolworths store closed down. 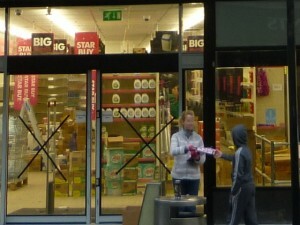 The chain’s buying director, Chris Edwards, subsequently confirmed my speculation that the site would host a branch of Discount UK – Poundworld’s recently launched multi-price format, which already occupies the former Woolies site in Middlesbrough – rather than one of its eponymous pound stores. When I passed the store on Wednesday, the hoardings that had surrounded the site for the past couple of months were still up, but I could see through the gap that all the new shelving was in place. Visiting again today, the hoardings have been taken down, the existing shopfront has been painted black (and had new automatic doors inserted), and the store is in the process of being stocked. 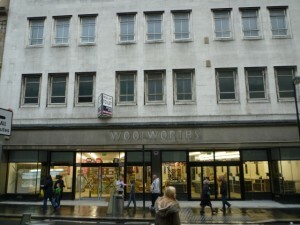 Looking inside, the shop appears to be larger than the Middlesbrough store, using much but not all of the former Woolworths shopfloor. The right-hand half of the store seems to go back further than the left. 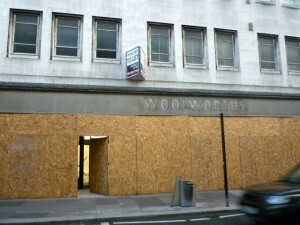 One thing that the store is still missing, however, is any signage – other than the remnants of the old Woolworths lettering, of course. With no evidence of any planning application having been submitted yet, I’m curious whether the store will still have any signage in place by the time it opens on Friday. If it doesn’t, the member of staff who was outside the store leafletting today may have to work extra hard to alert shoppers to the store’s arrival. 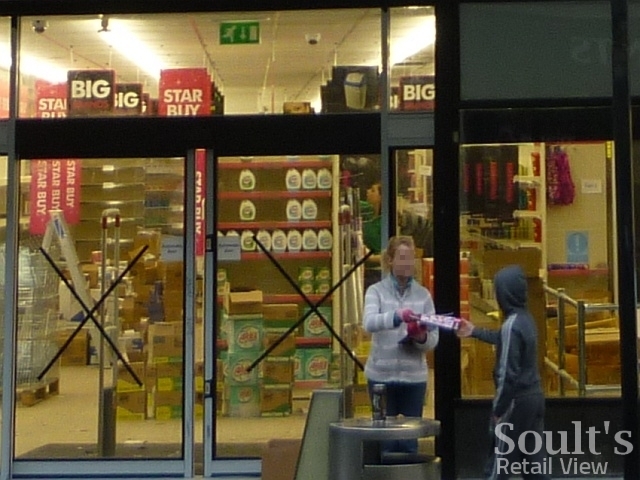 Today, she was handing out leaflets featuring the store’s opening deals and generally explaining to passing shoppers what Discount UK will be offering. 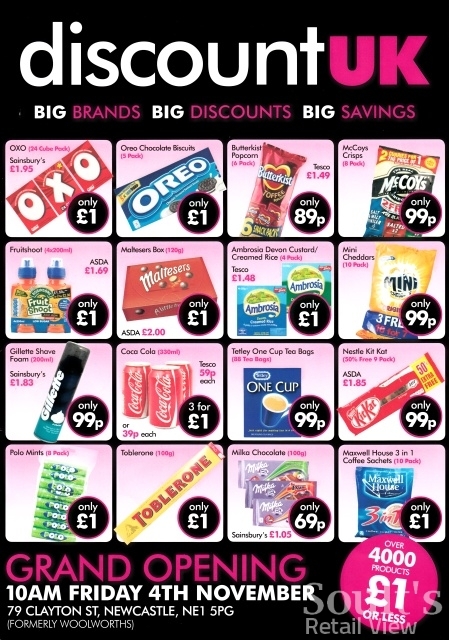 For all that Discount UK is a multi-price format, the four-page leaflet focuses very much on products costing £1 or under. 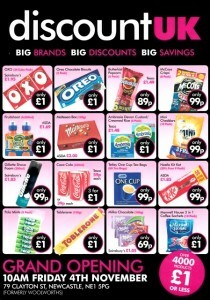 It reveals that of the 5,000-plus products that the store will stock, over 4,000 are £1 or less, including the various grocery, snack and confectionery items featured on the front page. Inside, the leaflet highlights some of the household and toiletry products found instore – including, eyecatchingly, a two-pack of pregnancy tests for just 99p – alongside a decent-looking range of Christmas cards, wrap and decorations. The back page features items from the Winter Guard range of car protection products, including the leaflet’s most expensive item – a £5.99 snow shovel. The flyer also flags up the ‘Celebrity’ (my quotes) Guest Day that will take place on Saturday (5 November), featuring the Emmerdale and Dancing on Ice ‘star’ (also my quotes) Roxanne Pallett. To be fair, Discount UK’s product offering isn’t that much different from what we can already find in Newcastle’s Wilkinson, Poundland or, indeed, Poundworld. 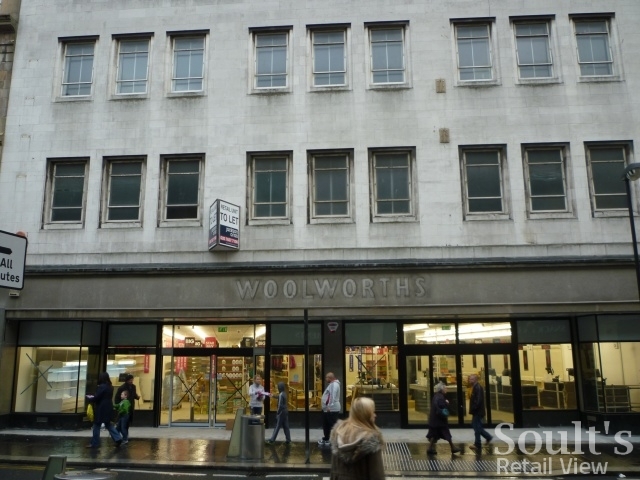 However, if its opening helps to bring some life back to a neglected part of Clayton Street, and reinforces that part of town’s attraction as a value retail destination, then it can surely only be a good thing for Newcastle city centre.